Between 1942 and 1944, the Germans built an extensive system of coastal fortifications along the western coast of Europe, from the Spanish border to northern Norway, as a means of preventing - or at least delaying - the anticipated Allied invasion of mainland Europe from Great Britain. The system was known as the Atlantikwall and, by June 1944, it comprised of almost 15,000 bunkers with over 3,000 guns. 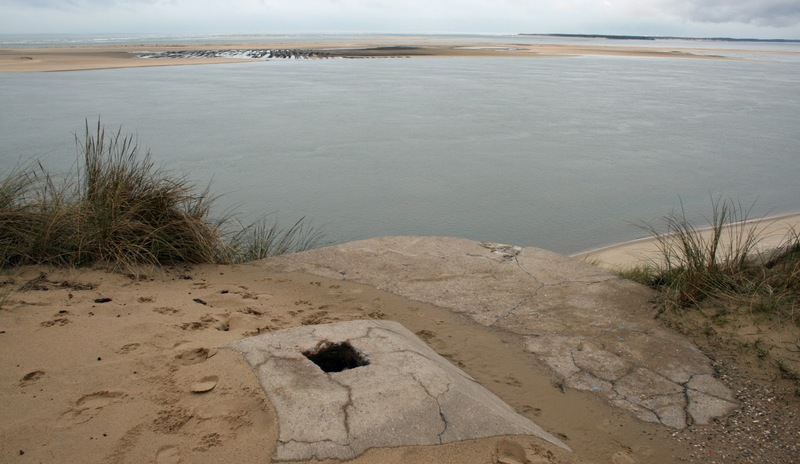 While, for obvious geographical reasons, the strongest fortifications were built in northern France, the Gironde coast was dotted with a number of command posts, pillboxes and bunkers. 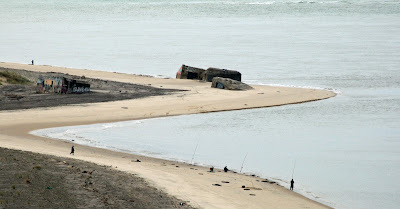 Some can no longer be seen at all: in 2002, the town of Lacanau Océan destroyed (with some difficulty) the seven bunkers which remained on its territory, a sure sign that the seaside resort wanted to rid its 21st-century landscape of these sinister remnants of the Second World War. 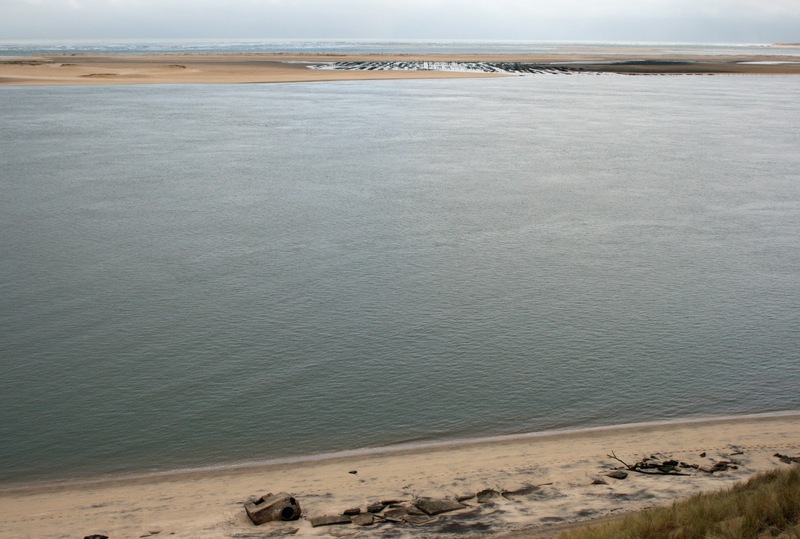 However, further south, on the Bassin d’Arcachon, many of the structures can still be seen – although they’re no longer necessarily at the exact spot where they were erected! Local enthusiasts have even set up an association (GRAMASA) aimed at researching, understanding and preserving this wartime "heritage". 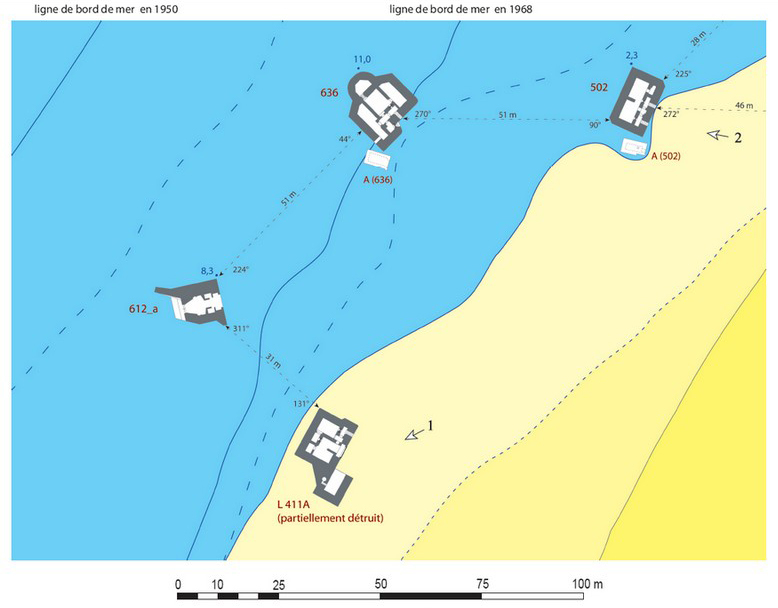 At the mouth of Arcachon's bay alone, three gun batteries and radar stations, built by an estimated 1,000 prisoners of war, were strategically stationed: Hortense (codename Ar34a) at the tip of Cap Ferret, Sablonneys (Ar46) at the southern end of the Dune du Pyla, and Gaillouneys (Ar47, pictured above), just a little further down the coast, slightly to the north of the beach now known as Petit Nice. The batteries were managed from the small town of Labouheyre in the Landes, under the command of the Bordeaux-based General Blaskowitz (come 1944). Given the pleasant climate and relative tranquility of the location away from the main theatres of war, the Germans had also positioned a radar and light projector training unit for new recruits 112 metres above sea level at the top of the Dune du Pilat! The equipment used in these facilities was anything but high-tech. Most brand-new weaponry was used on the Eastern front, while those manning the Atlantikwall often had to make do with near-obsolete WW1-vintage equipment, much of which had been requisitioned from occupied territories such as France, Russia, Belgium, Poland, Czechoslovakia and the Netherlands. Further north, British-made equipment was even found to have been used by German forces in Dunkerque and Dieppe! 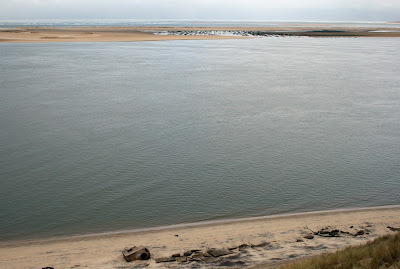 Many of these southern Bassin d'Arcachon constructions were positioned to enjoy strategic vantage points positioned high up on the dunes. Some are still there, in amongst the sand and sparse vegetation, while some have succombed to the constant movement of the landscape and tumbled 60 to 100 metres down to the beach. Others may have started out on the beach but, with the ocean gaining ground on the land, now lie out at sea at depths that can reach 25 metres. 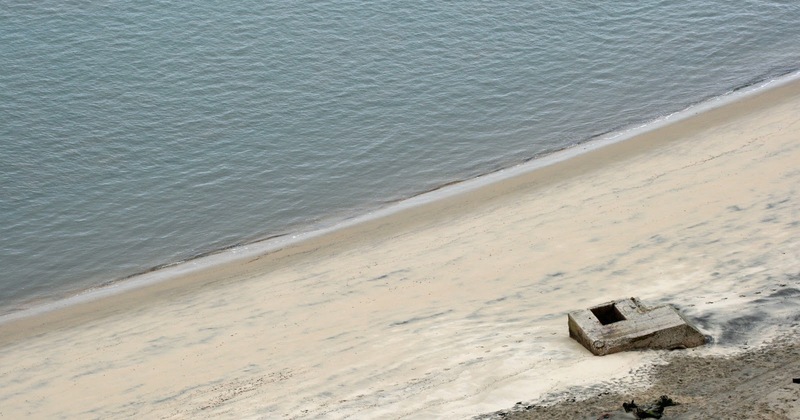 The picture below, taken from the foot of the Petit Nice campsite, shows one part of the Sablonneys battery which now spends its days in and out of the water, depending on the tide. 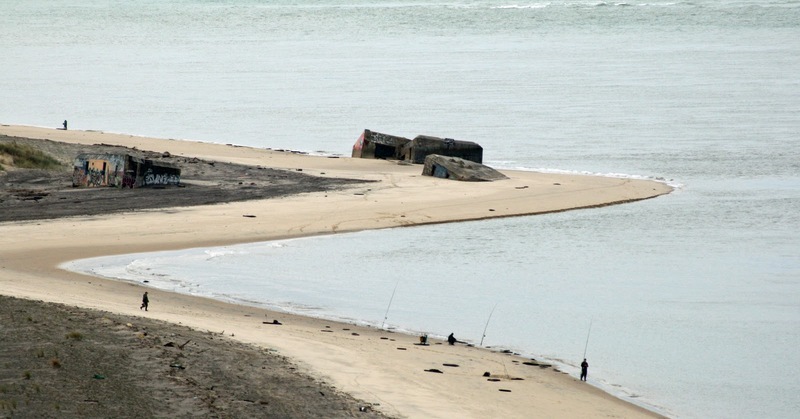 Further out, between the beached bunker and the Banc d’Arguin oyster park in the distance, three larger fortresses lie submerged in a triangular formation, with between 30 and 50 metres separating each one. These submerged bunkers are known locally as Le Filet, Le Congre and La Faille (The Net, The Conger and The Passage) and have become a popular spot with scuba divers. As well as the challenge of locating the bunkers themselves, divers enjoy observing today’s permanent residents of the bunkers, which include conger eels, lobsters, rays, sole and cuttlefish, while the walls are now covered with spectacular multicoloured sea anemone. The thought of wildlife repossessing these wartime ruins is a pleasant one. But unless you are a scuba diver, it will have to be a case of contenting yourself with the inhospitable, weather-beaten, graffitied bunkers on dry land... at least until they too slip below the surface of the Atlantic! Local association GRAMASA (Groupe de Recherches Archéologiques sur le Mur de l’Atlantique Secteur Arcachon) is doing a fine job preserving the remains of the Atlanktikwall, as reported by the BBC's Hugh Schofield. If you're sitting comfortably, you might also want to take in a Youtube clip of divers swimming through the submerged Sablonneys bunkers. This all seems familiar for some reason, and not just because I was brought up alongside a disused aerodrome with plenty of bunkers to explore..
Adam - Yes, a familiar sight indeed, although this is no place to divulge details of your past holiday trips... so I won't!!! Diane - However permanent, solid (and indestructible?) they seem, the structures have both the ocean and the movement of the dunes to contend with. To get an idea of how much the ocean is gaining ground, check out this detail from a GRAMASA map of the Gaillouneys battery, which shows the shoreline as it was in 1950, 1968 and 2005. Meanwhile, the dunes in that area are advancing inland - and by no means is this a slow process. 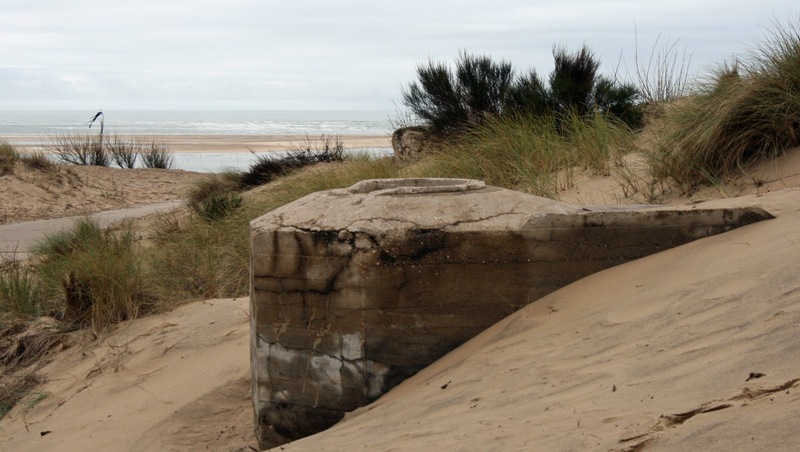 The campsites positioned behind the dunes are currently losing approximately 5 metres every year! 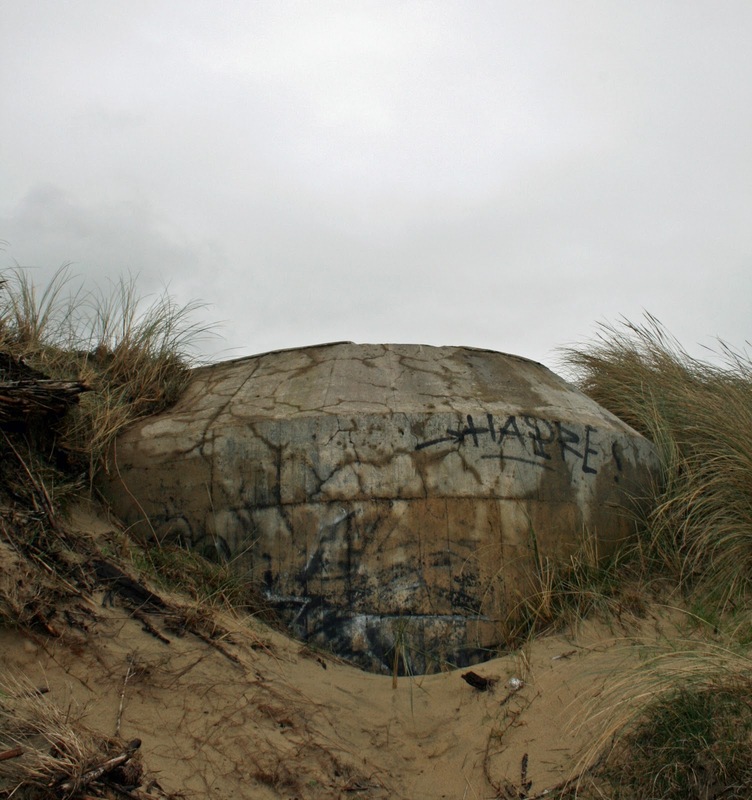 Achtung: Zose bunkers voz built to last 1,000 years, mein Freund! Zey is only falling down, ja, becoz you tommies und frenchies iz voking all over zem. Please to be reading ze sign sofort: Stayen Sie out! Thank you my German friend. I'm so thankful that today's battles are solely on football pitches and I trust that you're not practicing penalties ahead of Euro 2012... Please give us a chance! Yep, they're definitely worth checking out! Great subject and nice pictures. Thanks! All the best over at the submarine base! Wow. As a child I spent two summer holidays at Pyla sur Mer in 1972 and 1973. I remember these bunkers being right on top of the dune back then. It's amazing how 40 years later thay are now almost subsumed in the ocean. That whole area is very much a constant work-in-progress. I reckon that another 40 years down the line and it will be another story completely and only scuba divers will be able to continue viewing them!